It is the last Saturday of March, were did the month go. We still have so much winter here. We got snow a few times this week and it is not melting out in the country yet. Maybe by Monday it will be warm enough to melt some. 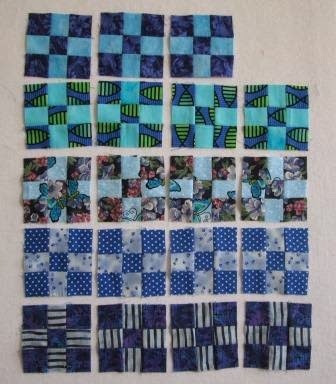 I got a few blue and teal nine patches done. They are not very big but fun to just plug away at doing. 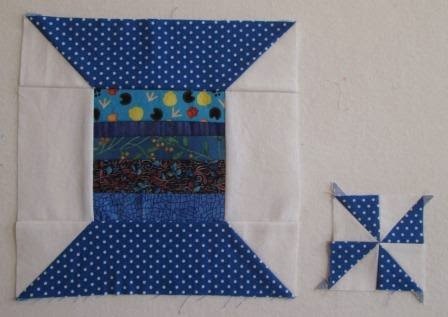 Next I got done a blue spool block. 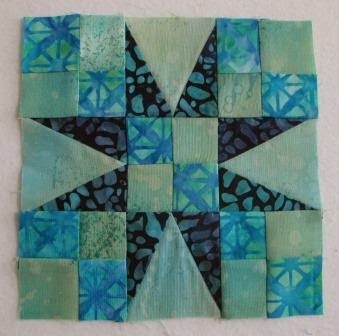 The little pinwheel is from the bonus triangles I cut off. 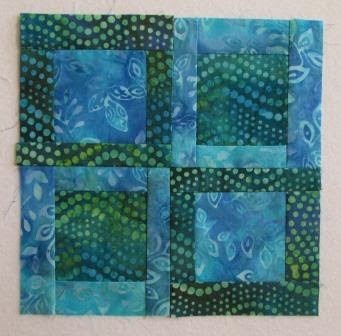 Here are 6 sampler blocks. They are all 6 inches and so cute. New York Beauty done with a little paper piecing and curves. 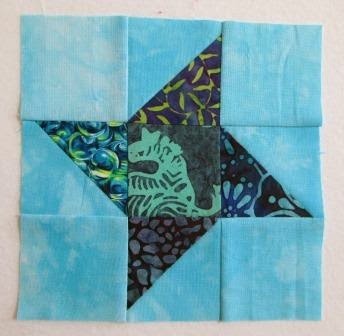 A block from my City Sampler book, 100 modern quilt blocks. 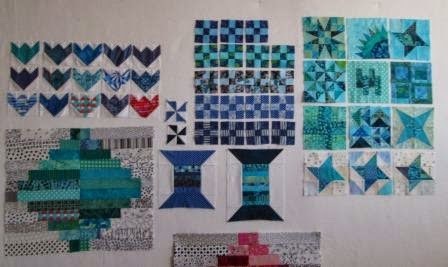 Here is my design wall with the whole months worth of teal aqua and a bit of blue. I love to see what I did over the whole month. Pup in the sunny spot. I have added my post to Soscrappy. WOW! You got so much done with your teals. All your blocks are looking so good. Love that NY Beauty. Great choice of color values. What a great month! You got so much done and they look wonderful. The 6.5" New York Beauty is beautiful. 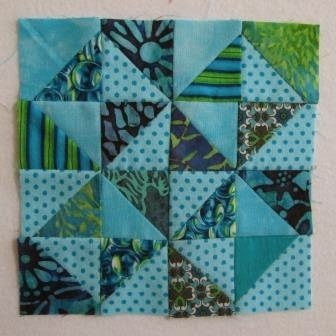 Very lovely blocks. I love the puppy. 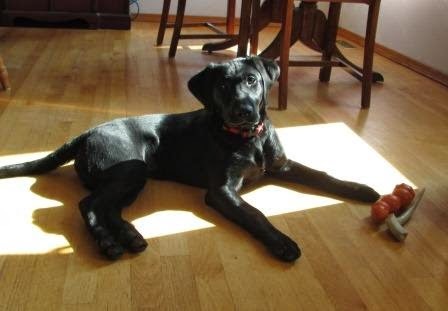 My daughter has a black lab. She trained him to be a pet therapy dog. 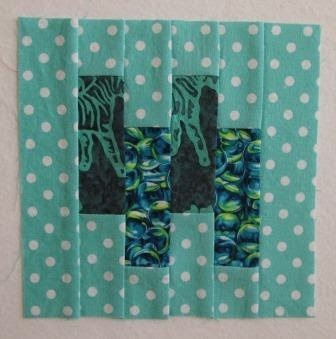 I love your fabrics and blocks. Wow, wow, wow! It is fun to see all you have done for the month of teal. I have to say Wow too! 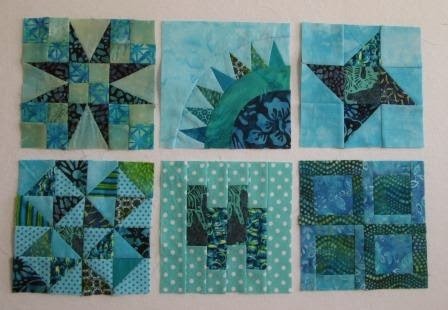 So many lovely teal blocks, impressive.